Product prices and availability are accurate as of 2019-03-24 00:16:10 UTC and are subject to change. Any price and availability information displayed on http://www.amazon.com/ at the time of purchase will apply to the purchase of this product. 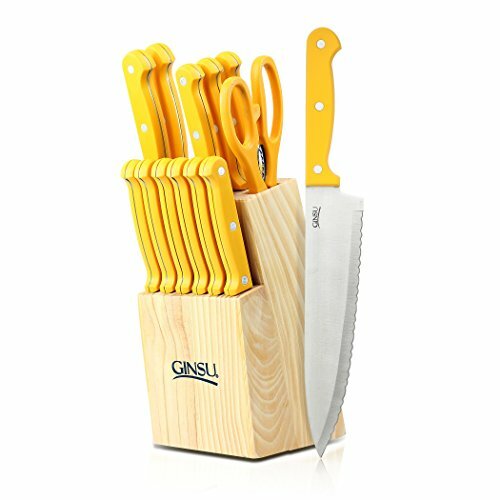 Say hello to the most popular version of the Ginsu Essential 14-piece cutlery set. 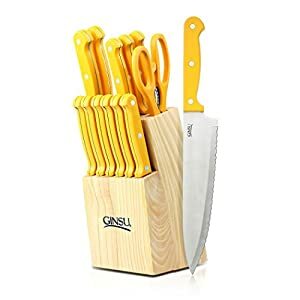 This block of knifes includes all the mainstay blades a kitchen needs like steak knives and a chef's knife while also providing some specialty knives for more specific cooking techniques. An included 5.5" boning knife is the perfect tool for outdoor enthusiasts looking to debone their food to make a stock, while anyone who enjoys the famous longevity and sharpness of Japanese cutlery will love the 7" Santoku knife. Like any Ginsu Essential knife set, this one brings unparalleled strength and durability to its blades. All blades are made of quality stainless steel for a low-maintenance knife, but be sure to only wash them by hand. Symmetrically serrated edges on the everyday use knives let you cleanly and quickly cut food apart without tearing it. The whole set is housed in a beautiful natural wood block and comes with a limited lifetime warranty!.